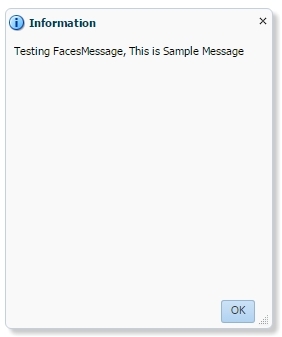 We all must have used FacesMessage somewhere in ADF application, FacesMessage is used to show any notification like an error, warning or confirmation. In this post, I’ll show you how to resize FacesMessage. -tr-default-content-width The root style, af|dialog, contains skinning property “-tr-default-content-width” that provides the default contentWidth if not provided when stretching is turned on, “stretchChildren=first”. The default is 250 pixels. -tr-default-content-height The root style, af|dialog, contains skinning property “-tr-default-content-height” that provides the default contentHeight if not provided when stretching is turned on, “stretchChildren=first”. The default is 250 pixels. Thank you, this will be very useful for me. I have a question: I am calling programmatically facesmessage. Let me know this code will work or not? Thanks, For Programmatically Facesmessage Resize is working now I check it. With which steps did you reach this solution? and no googling like "resize facesmessage popup"? I am not getting what you really want to know, Why don't you use your name ? Thanks. Its working in google chrome but not working in IE11. Message popup width taking 100% of windowin IE.could you please help me.